Our unique bond system, comprising of a mixture of specially selected alloy’s, ceramic’s and diamond coatings offer the added benefit of a lower spindle load, excellent thermal stability, reduced tool deflection plus longer spindle life and less heat transfer to coolants. With all of these benefits, superb quality and consistency, plus some of the most competitive pricing in the industry what do you have to lose? 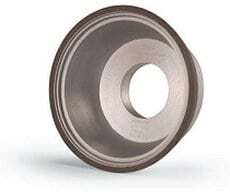 Phenolic Resins. 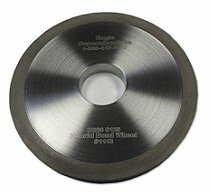 Typically used for dry grinding, off-handgrinding and general purpose tool room use. Polyimide Resins. These resins offer considerable performance increase over phenolic resins. Greater stock removal, better form holding, higher temperature tolerance and minimal wear are all benefits of polyimide body systems. Resin Bond – Min. Diameter 1/8 in. / Max. Diameter 24 in. 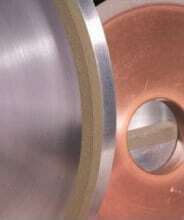 Vitrified bond CBN wheels are extremely aggressive and free cutting. 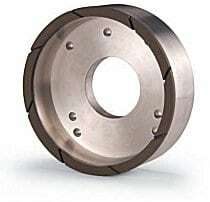 They provide excellent tool life, are cool cutting and are the most suitable for “lights out” high production grinding of automotive, aircraft and heavy engineering machinery such as bearings, gears, camshafts, crankshafts. When used with diamond powders, vitrified bond diamond wheels can be used for the grinding of PCD, ceramics, semiconductors, etc. Metal bond offers the best grit retention and a very long service life. Form holding is the best available, but it requires high horsepower machinery and is much slower cutting than resin bonds. Typical applications for metal bonds are grinding glass, ceramics, ferrites, tile, stone and quartz. Metal Bond – Min. Diameter 3/8 in. / Max. Diameter 16 in.